WELCOME TO MY BOHIO "TAINO SPIRIT"
TAINO/CHEROKEE ARTIST. MY PAINTINGS HAVE BEEN EXHIBITED AT THE MUSEUM OF NATURAL HISTORY, UNITED NATIONS, BRONX BOROUGH PRESIDENTS GALLERY, ECT. I HAVE BEEN IN THE ART INDUSTRY ON A PROFESSIONAL LEVEL SINCE 1968. MAKING PAINTINGS, STATUES, STORYBOARDS, SPECIAL EFFECTS. 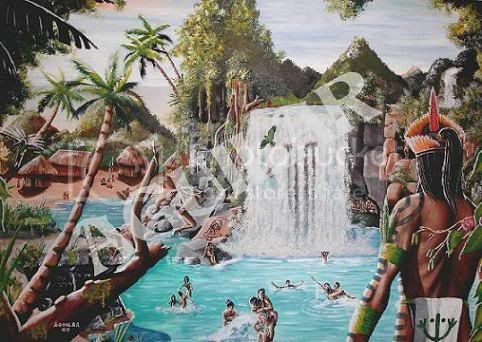 MURALS (AFRICAN SAFARI (LIVING ROOM) ATLANTIS (DINNINGROOM) SPIRIT OF THE DRUMS (TWO STORY WALL MURAL) ETC. COMPANY LOGO'S FOR, HOTELS ,TOYS, RADIO STATIONS, CONSTRUCTION, BANKS. NOT TILL I BEGAN PAINTING AND MAKING SCULPTURES OF MY CULTURES, MY HERITAGE, DID THINGS BEGIN TO HAPPEN. EVERYTHING BELONGED TO OTHERS EXCEPT WHO I AM. MY GREATEST STUDENT IS REINA MIRANDA WHO ALSO HAS BEEN ON EXHIBITION ALONG WITH MINE. 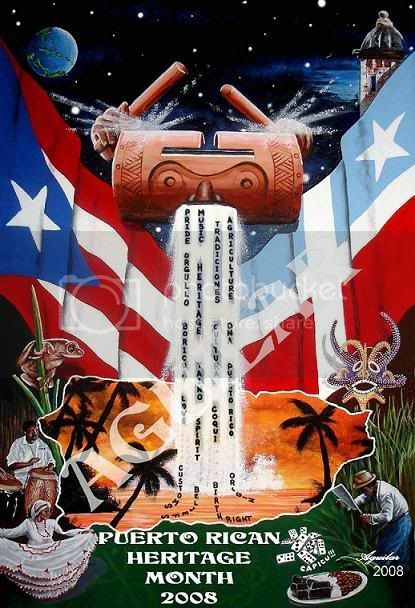 THAT'S WHEN "TAINO SPIRIT" WAS BORN. Anegwaba waitiao sorry for not writing to thank you any sooner for attending and vending at Areyto 2008. Hahom for the posters you gave the people. They where totally thrilled to have gotten a copy especially signed by you. Your artistic work is inspiring and has helped the resurgence movement move forward in a positive direction. Hope we cross each others path again soon my brother, Ahiahude waitiao tau tau. Hello and a warm welcome Aguilar, and I agree with all of the positive assessments of your great work. I am the site administrator for this network and it would be my pleasure to answer any questions you might have about using this site. In the meantime, enjoy, and I hope you find your experience here rewarding. TAINORAY, AGAIN BO'MATUM FOR YOUR WORDS. I WAS TOLD BY SOME OF THE COMMITTEE MEMBERS THAT THEY NEVER SAW ANY PAINTING GO SO QUICK OR POPULAR. I WAS HONORED THAT ALL THE POSTERS WENT THAT QUICK, AND THAT THEY BEGAN TO HAND OUT LAST YEARS POSTERS, . I SIGNED HUNDREDS (MAYBE A THOUSAND). I COULDNT BE IN ALL THE PLACES THEY WERE GIVING THEM OUT THRU OUR NYC AND OTHER STATES. AGAIN BO'MATUM. I like them both. The Award winning poster has NYC buildings and landmarks that brings it all together for me a person who was born & raised there. It also puts our culture in this moment of time. I mean when you look at the poster you know that its 2008.